I'm lucky. Last week, Scott made me delicious, healthy meals while Danielle took care of me; making sure to drink fluids, take pills, etc. This week, Andrea is here. 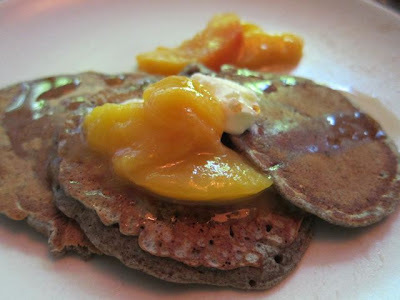 From Vermont, Pam brought the best maple syrup I've ever had so I asked for pancakes to sop it up, Andrea made these extra nice with some nectarine compote. I feel lucky and grateful to have the greatest friends in the world. You have some great friends, who also happen to be great cooks! Well done! love to hear this! love it. miss you.